Video demonstration for creating forms and molds of unique designs for concrete countertops. Nearly all concrete placed anywhere is molded in one way or another. A mold is really the same thing as concrete formwork-or shuttering if you're British. But it's usually only called a mold when it is smaller, more detailed-such as for a countertop or a sink or concrete furniture. Although some people refer to stamped concrete surfaces as being molded when referring to the pattern or texture, such as on patios and walkways. A popular feature of concrete countertops is an integral molded sink. 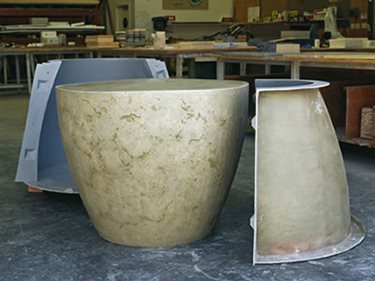 "I do lots of integrally cast-in sinks," said Phil Lampe, Lampe Concrete Studio, San Marcos, California. "I think that takes advantage of what you can do with concrete that you can't do with other materials." Countertop makers mold these sinks either with their own custom-made molds or with purchased molds. What the molds have in common is that they must be smooth and waterproof and able to hold the concrete in place until it sets. Materials that meet those requirements include fiberglass, Plexiglas, rubber, and polystyrene. In this article, you will learn a little about countertop molds and a little more about sink mold and countertop mold inserts. For a detailed explanation of how to make a countertop mold, get a copy of Fu-Tung Cheng's book, Concrete Countertop Book.